Stephen "Younger Brother to Alec" Baldwin is known much more these days for his constant proselytizing and bizarre behavior than for acting, and the lack of work may now be catching up to him. 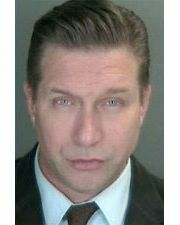 CBS New York reports that Baldwin was arrested today for failing to file income tax returns for 2008, 2009, and 2010, and owes the state more than $350,000. On the bright side, his mug shot features his trademark duck face.